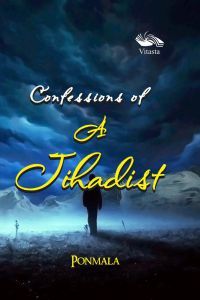 Product description: Confession of A Jihadist is written by Ponmala and published by Vitasta publishing. Buy Confession of A Jihadist by Ponmala from markmybook.com. An online bokstore for all kind of fiction, non fiction books and novels of English, Hindi & other Indian Languages. A strange twist of fate makes a secluded Muslim woman the wife of a Hindu man. He builds a life with her but it all goes horribly wrong after a personal mishap, which leads him towards jihad. Is he finally a person with a misguided purpose or does he get a hold on his life? The Confessions of a Jihadist is a gripping and unpredictable story of how an ordinary young man hurtles towards the dark alleys of jihad, which he feels will bring him redemption from his melancholy.